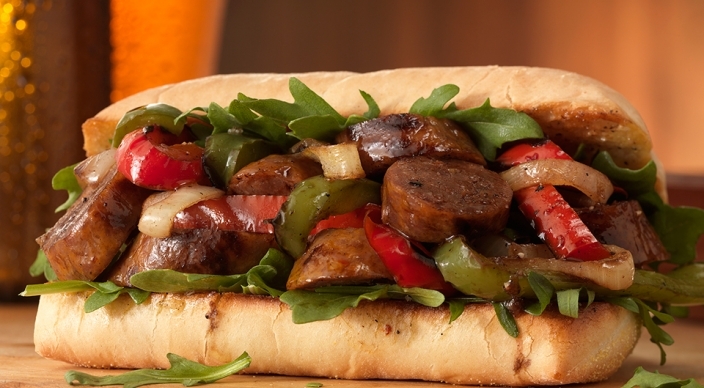 In North America, Italian sausage most often refers to a style of pork sausage . The sausage is often noted for being seasoned with fennel as the primary seasoning. In Italy, however, a wide variety of sausages are made, many of which are quite different from the product commonly known as ‘Italian sausage’ in North America. The most common varieties marketed as “Italian Sausage” in North American supermarkets are hot, sweet, and mild. The main difference between hot and mild is the addition of hot red pepper flakes in the spice mix of the former. The difference between mild and sweet is the addition of sweet basil in the latter. In Australia, a variety of mild salsiccia fresca (literally meaning “fresh sausage”) seasoned primarily with fennel is sold as “Italian sausage”. 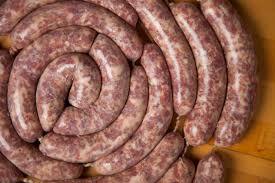 A sausage is (not always) a cylindrical meat product usually made from ground meat, often pork, beef, or veal, along with salt, spices & other flavourings, and breadcrumbs, encased by a skin. 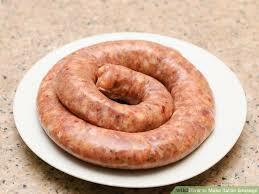 Typically, a sausage is formed in a casing traditionally made from intestine, but sometimes from synthetic materials. Sausages that are sold raw are cooked in many ways including pan-frying, broiling & barbecuing. Some sausages are cooked during processing. The casing may then be removed.